Now that's a happy plane ride home. That'll be a six hour flight that will feel awfully good to twenty-five guys that finished a road trip at 5-4 on the highest note possible. And we all overlooked Josh Beckett. Many of us wrote off his career. We questioned whether he even belonged in the rotation. A 34 year old washed up former superstar pitcher is what most of us pegged him as, and add to that he was coming off career threatening surgery. The same surgery that ended the career of Chris Carpenter two years ago. Thoracic outlet syndrome is serious business. The procedure to correct it can easily be labeled as riskier than Tommy John surgery because there isn't a track record of pitchers coming back from it in large numbers, especially 34 year old pitchers on the downside of their careers. 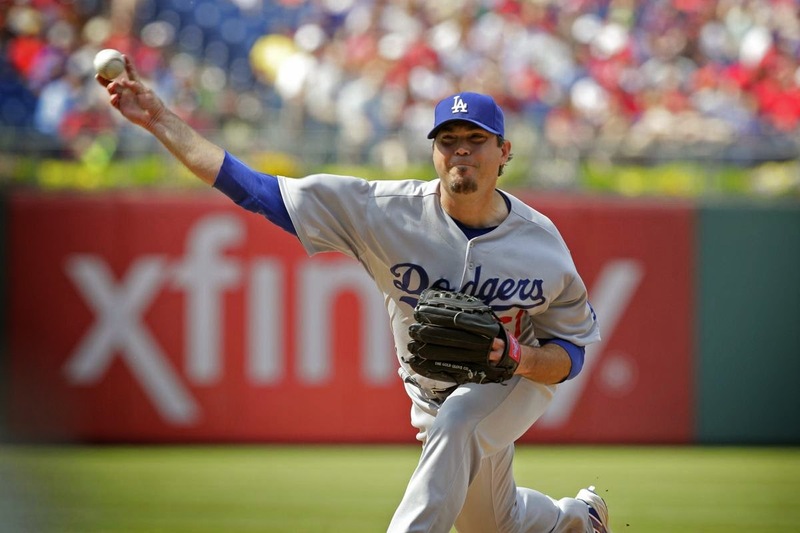 But Josh Beckett showed us all something today. He showed us that he cares. He showed a fire in his belly that we seldom see from a low key guy. He wanted that no-no, and he wanted it bad. So much that he uncorked a few fastballs in the mid-90s in his final inning of work. So much that he actually was guilty of overthrowing a few to Rollins and Utley. He was bearing down like no other in the eighth and ninth. Beckett could taste that no-hitter and he would not be denied. "I'm going to throw as hard as I can and see what happens. Right now, I feel great. I'll throw the ball until I blow out and I'm hoping that's not for a few years." Well blow things out has has, as in blowing away the opposition. Beckett haas made his money. He has nothing to lose, so why not air things out and pitch like there's no tomorrow. That makes a guy like Beckett an extremely dangerous pitcher on the mound. I'm liking what I'm seeing and I think it's safe to say that Beckett just might be a 15 game winner this season and a real presence down the stretch and in post-season play. So the Dodgers now have 21 career no-hitters on record, the most in major league baseball, but it has been a long time since the last one as today ended a 17 1/2 year drought of no-hitters by the Dodgers. the last one was Hideo Nomo's Coors Field gem in 1996. Beckett joins the club along with Nomo, Kevin Gross, Ramon Martinez, Jerry Reuss, Fernando Valenzuela, Bill Singer, Sandy Koufax, Carl Erskine, Sal Maglie and others. It's a prestigious group and one to not scoff at. The wonderful thing about pitching a no-hitter is you'll always be remembered in Dodger lore for the event. 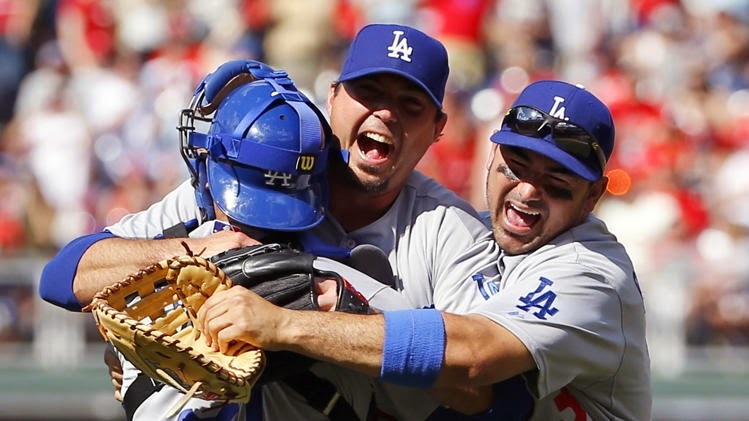 Josh Beckett will always have May 25, 2014 to look back at. No-nos are rare enough that we always remember them, often times exactly where we were when they happened. Like in 1970 when I was listening to Bill Singer's no-hitter against the Phillies in my parents room, during a mid-week afternoon game. Dad had the one radio in the house, so I listened to it on that console stereo they had in that huge room. Then there was the amazing Nomo no-no in Colorado. Not only pitched in that bandbox, but against the likes of Bichette, Burks, Castilla and Galarraga. Topped off by doing it in wet conditions, Nomo pitched the entire game from the stretch because of the slippery mound, which always made me wonder why he didn't always pitch from the stretch after that. I watched that game sitting in my house in San Francisco, amongst members of my wife's family, all Giant fans rooting for the Rocks to break that thing up. That was a fun one to watch. No-hitters take us back in time, and I'm sure I'll remember how I watched the Beckett no-hitter. On a mini I-pad in this studio apartment in Alexandria, Virginia...between work travel assignments. I watched it alone and had no one to share it with. That was until the 8th inning when I started texting my son who is back in Thousand Oaks attending jockey school, and before I had finished a sentence, he was calling me to make sure I was watching the thing. It was a special day...for all of us. Hopefully this is the catalyst to start something really big with the Dodgers. 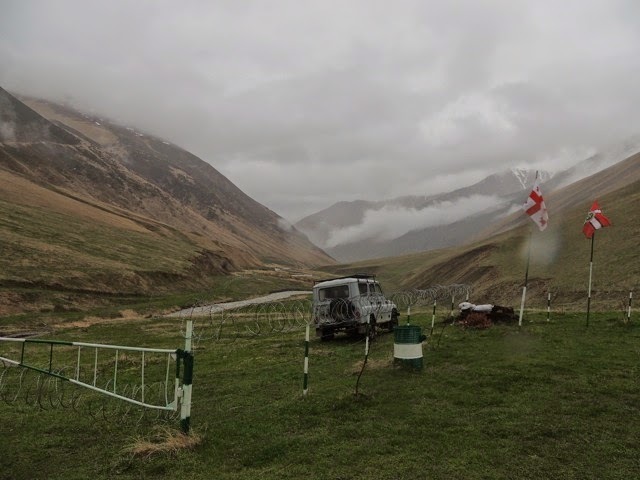 As I arose on May 10th in an obscure town at the feet of the Caucasus Mountain range, Republic of Georgia, a full day ahead of me awaited. It would include a ride up to 12,000 feet, to a remote border post on the Russian/Georgian border. In the process my group would traverse rivers and dodge mudslides. I'd partake in viewing some of the most beautiful scenery ever seen. We were past the tree-line altitude level. 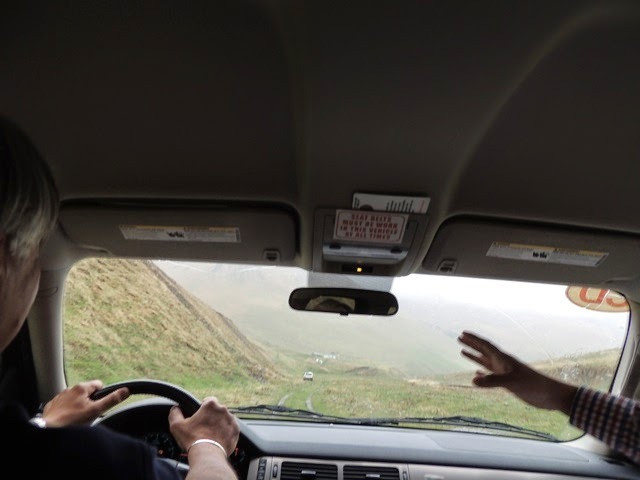 When the Chevy Suburban we traveled in had a flat tire, we all hustled to get that thing changed quick, because the rain was torrential and that river we need to cross in the vehicle was quickly rising in size. That stream below became a raging river in a few minutes after the storm hit, but we made it through...and so did the Dodger game on my I-phone. And then there were the Dodgers. Eleven time zones and half the world away but still in this wacked mind of mine...in my thoughts because I knew they were playing the Giants. It was hailing on us and we would seek shelter inside the vehicle, but with all that my I-phone had a couple of bars of reception. "Hmm...I wonder if...no, there's no way...can I possibly can get the MLB app to work up here? Not at over 10,000 feet in a hailstorm..."
I tapped the app, and I'm pretty sure became the only person in the world that watched the Dodgers from eleven time zones and 10,000 foot of altitude, probably ever. It was the Dodgers-Giants in a barn burner. Got to watch Mattingly get ejected. The Georgians in the vehicle didn't quite understand my fascination with the game played by guys in tight matching uniforms and some with strange looking high socks. They were entertained by the nose to nose argument between manager and umpire. Baseball is a difficult game to understand by those that have never been exposed to it. Though the game is engrained in us on the American continent at an extremely young age, imagine being on earth over 40 years and never experiencing it. That was the audience I had of Georgian Border Police officers, that spouted off questions to me through my translator. "Why are they touching their privates?" "There's too much stopping in this game." "How can you follow that little speck of a ball?" "Does the ball hurt if it hits you?" "Why is it that the guy throwing the ball twists and turns his body so much?" You never know how the game is viewed internationally, but I had an eye opening experience fielding those questions while the Dodgers lost the the Gnats 3-1 at Dodger Stadium that night...(err, morning for me). Following those excursions, (unless something last minute comes up), there's a bit of a respite from travel...at least until August. Perhaps then I'll be able to catch up on Dodger news, and start things rolling at OKP once again. I know there's been a lot of doom and gloom opinions about the Dodgers in the blogging world, but I can't help be remain optimistic about this season. They haven't got hot yet, and that is bound to happen at some point soon. They haven't played well at home, and the law of averages points to that happening sometime soon. The outfield is solid and so far, and there are no signs of grumblings from within. The Dodgers haven't played well at home, and that will eventually occur. A 9-1 run at Dodger Stadium will really change the tune of just about everybody and I can see that happening. The plan for most good teams is to play near .500 ball on the road and about .650 ball at home. They're doing their part while wearing the grey uniforms. Now it's time for them to get things in gear in the home whites. One more in Philly. A win to close out this roadie would do wonders for the team (and fan) psyche. It was nice to sweep Minnesota to start off the road trip, but at the expense of what? The entire pitching staff? I'm becoming a true believer in the adage that "you can never have too much pitching." Based on last season and the start of this one, Los Angeles has proved it to be true. 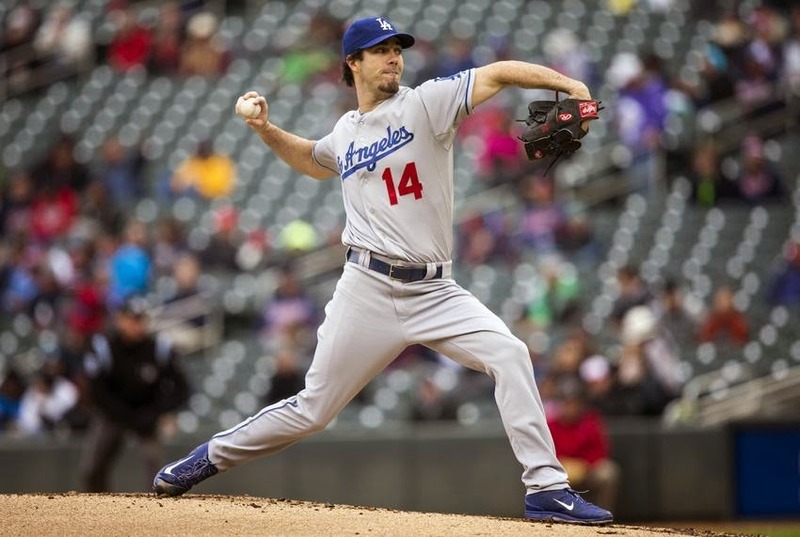 The Dodgers current state of the pitching staff is precarious at best. Overworked and weary they are, and just two days into the month of May. This is a serious situation and arms are bound to be falling off by the all star break if their torrid pace of use continues. *An abnormally amount of extra-inning affairs. Seven out of 29 games have gone to extra innings. That's over 24% of their games. Not only are extra innings required of the staff, but taxing ones at that. This takes a toll and as the season wears on, either injuries surface or a deterioration of quality develops. We may already be seeing that deterioration in Kenley Jansen's performances due to over work. His 34 pitch 12th inning last night was painful to watch. He didn't miss many bats, that's for sure. *A starting pitching staff that can't close out games. It's the state of the game today. The complete games is slowly being phased out. Pitchers aren't groomed to finish games. Multi-million dollar contracts have forced organization to exercise caution and protect their best starting pitchers. What has resulted is overuse of relief pitchers. *The absence of Clayton Kershaw for the first five weeks of the season. If there is a Dodger that has been counted on to eat innings, it is Clayton Kershaw. Don't think for a minute that his absence hasn't hurt. It has a lot and the bullpen has paid the price. Things should be better on that front in a few weeks. I say a few weeks because Kershaw will be allowed to pitch with extreme caution. Don't expect any CGs out of Clayton for a good while. *The baseball mentality that Mattingly has bought into, results in bullpen overuse and burning up relievers to get one out. Setting up those strategic match ups are a pet peeve of mine in today's game. The creation of the one-inning closer is another. Both of these scenarios have changed the baseball mentality of coaches from the Little League level up t the majors. Pitch counts are relied up too much. That 100 pitch limit is seen as a universal "pull my guy out" level. These changes in the game are too fully entrenched. Young men entering the majors haven't got the stamina to last into the deep innings. It has preserved careers probably, but only for starters, because now relievers are overused. Watch for another roster move soon. By the time that is made, I'll be on a plane, so stay tune at the other blogs for an announcement from Miami. Red Patterson will probably be optioned out, which is a shame, as the kid deserves at least a few days to enjoy the big league per diem and the major league clubhouse spreads. Kudos to the kid for pitching 5 innings of quality baseball. Too bad the run support wasn't there. A concern has to be there about the horrid and embarrassingly pathetic Dodger defense during the first 29 games this season. That Keystone cops routine in the first inning yesterday during game one was just something you shake your head at and say, "only the Dodgers." I think it's time to simply accept the fact that this team isn't very good at catching and throwing the ball. There will be games lost on account of the "D." Fortunately the opponent was the Twins yesterday. Good teams will take advantage of those defensive miscues and convert them into wins. The Dodger players are who they are. 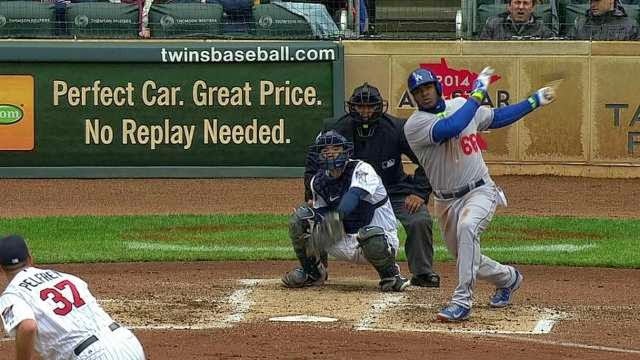 No amount of practice is going to fix Crawford's arm or Hanley's double clutching. Those guys are professionals and will have to shore up their defensive game or risk national embarrassment when the games gain much more attention during the pennant race stretch.